NEW ORLEANS – The first national coaches’ poll of October for NCAA Division III cross country has been released, and North Central (Ill.)’s men and Williams’ women are still the unanimous No. 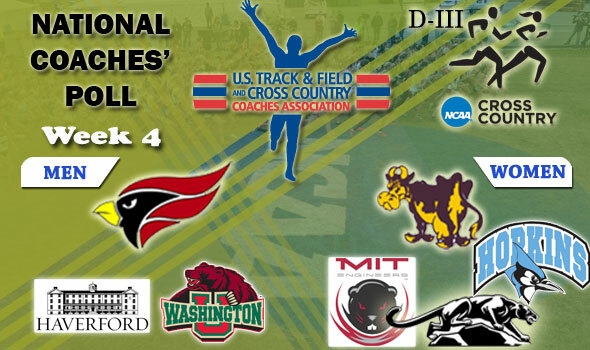 1 squads according to the voter-members of the U.S. Track & Field and Cross Country Coaches Association (USTFCCCA). The men of NCC have been No. 1 since the beginning of the season while Williams’ women enjoy their second week at top of the poll. The top four men’s squads are the same as they were last week as No. 2 Haverford, No. 3 Washington (Mo. ), and No. 4 SUNY Geneseo round out the crew. On the women’s side, No. 2 MIT remains pat while Middlebury gained a spot to No. 3. Johns Hopkins went up to a tied-No. 3 from No. 6. At No. 32 Wartburg’s men make their season debut in the poll while, in the women’s poll, No. 26 Kenyon and No. 27 Wesleyan (Conn.) are recognized in the top 35 for the first time this year.